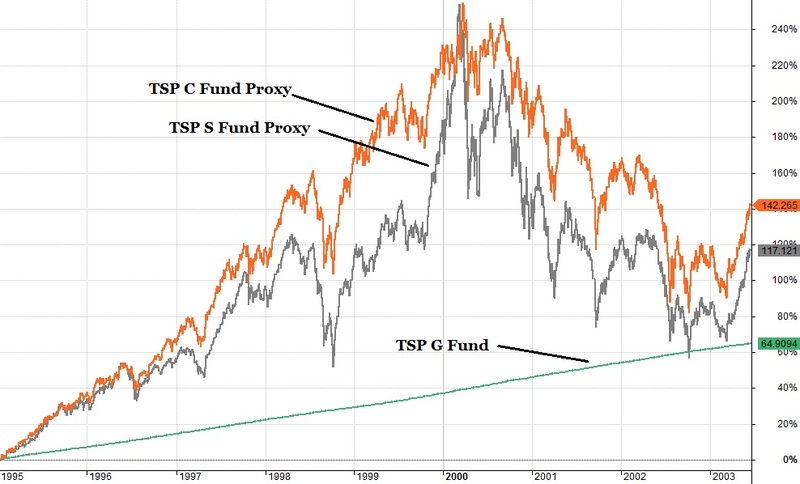 Using the market index data for the TSP C and S fund we were able to calculate the TSP C and TSP S share prices back to 1987 when the TSP S fund's index was first developed. We were also able to extrapolate the TSP G fund prices using the TSP websites monthly returns back to this time also. We wanted to research strategies for the funds and this required looking back further than 2003. This also enabled us to produce charts like the one below. It is surprising the two US equity funds are in a dead heat looking back over 27 years. But as you see, it has not always been this close. 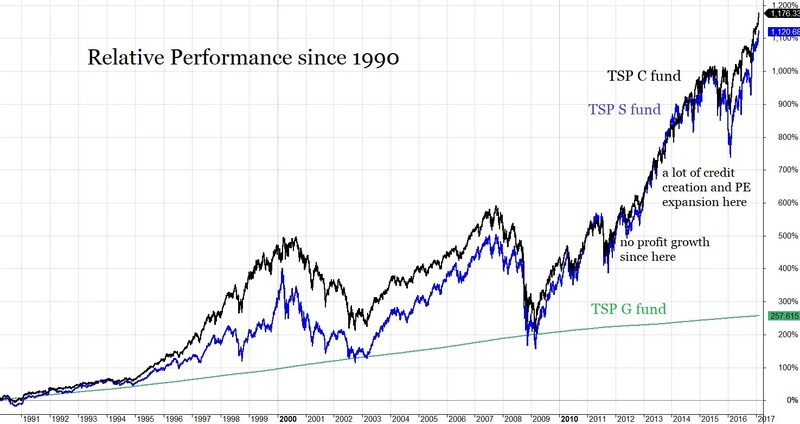 During the 2000 stock market bubble, the SP500 outperformed significantly and the TSP S fund (which I call the non-sp500 index) lagged except during that melt up in late 1999. The two funds were back to even by 2011 after taking beating during the two bear markets. The Thrift Savings Plan began publishing daily prices in 2003 with all the funds starting with a share price of 10. The chart below is the typical chart found on many website. The problem with this chart is that it begins shortly after the market bottom in 2003 which makes it a little misleading from a long-term perspective. Why? 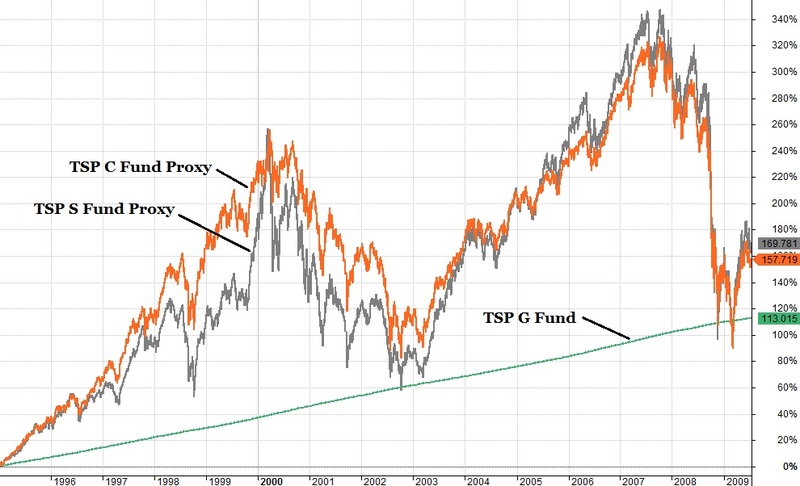 Because as you see in the chart above, the small caps were behind the large cap TSP C fund in 2003 and had some catching up to do. A couple of key points from these longer term charts are small cap stocks do not always grow faster than the large cap stocks. But the small caps have been more volatile meaning they advance more in bull markets and lose more in bear markets. The same is usually true in market corrections. Because of this small caps tendencies we found they were an especially good candidate for the strategy we were researching at the time that reduces market exposure during the summer and fall of the year the weaker months of the year for the stock market. Take a look. You may have heard of the saying "Sell in May". 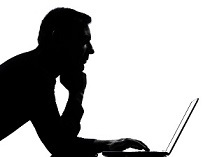 In my research of newsletters and investment strategies, I discovered a widely followed newsletter written by Sy Harding who developed an advanced but simple version of "Sell in May" that was designed for broad index funds. Since Sy's strategy only required two allocation changes a year, it met my qualification as "simple" and could be used on TSP accounts. He applied his strategy to the Dow Jones Industrial Averages with extraordinary results. The next chart is a little hard to believe. 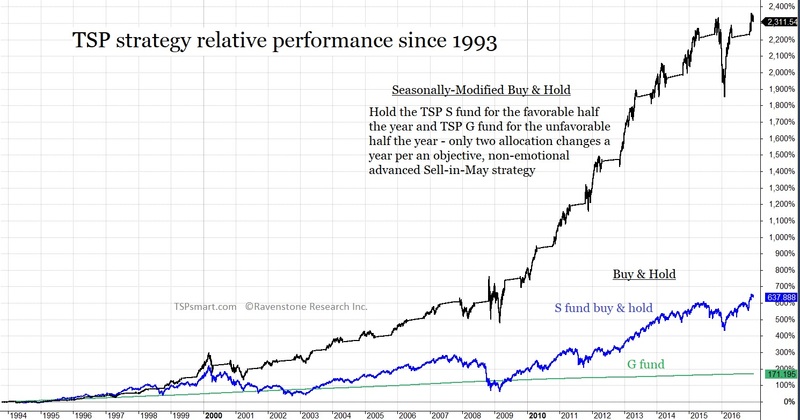 Building off his work, we optimized the seasonal strategy for the TSP US equity funds. It works best with the TSP S fund. The chart below shows what happens when you move to the TSP G fund for the summer and fall months based off this objective strategy. See why I consider this the best TSP investment strategy. In the next section we look closer at the current market cycle. The next chart begins with the last market peak in 2007. 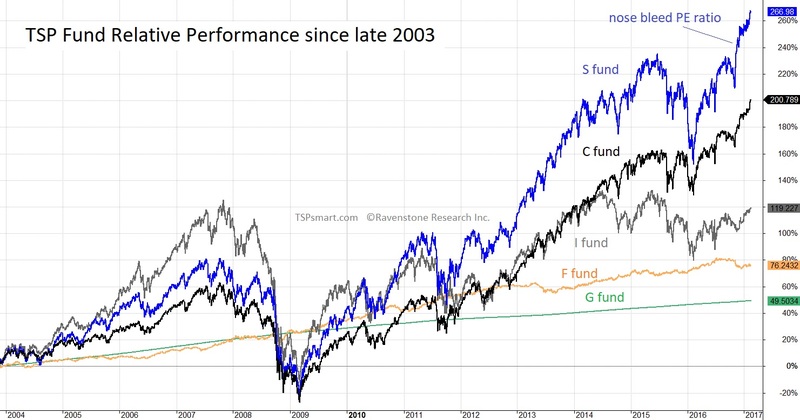 While the chart is not current, we can still see the S Fund outperformed the other funds overall during this cycle which leads many to view the TSP S fund is a better investment choice. My view is that it simply means it has more to give back during the next bear market. The TSP S Fund is made up of small and medium capitalized companies and currently sports a extremely high valuation level in terms of price-to-earnings. How have the funds compared since 2011? 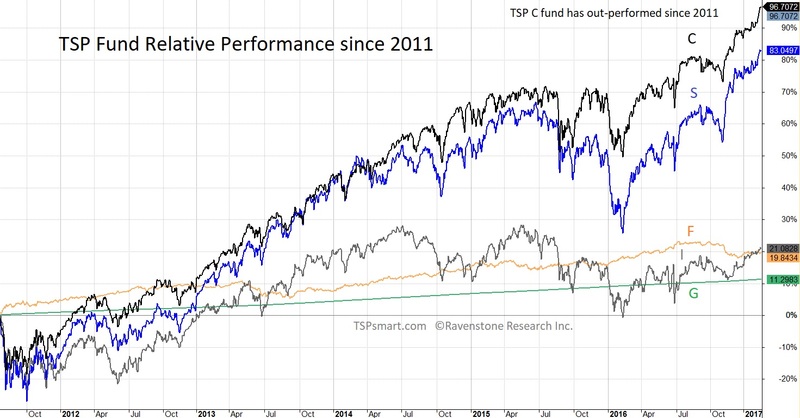 The TSP C fund has outperformed. We also see the S fund has been more volatile since 2011. This time frame has another significance - corporate profits have barely advanced above late 2011 profits levels. Yet... the SP500 is about 90% more expensive when this chart ends. Note: While the F fund looks like a better fund than the G fund, do not expect it to outperform the G fund over the next market cycle. The F fund had the benefit of the Federal Reserve manipulating interest rates down to historic lows which enabled the F fund to capture the capital gains. I expect the G fund to be the better choice going forward. You can review Compare TSP F & G funds for more information. 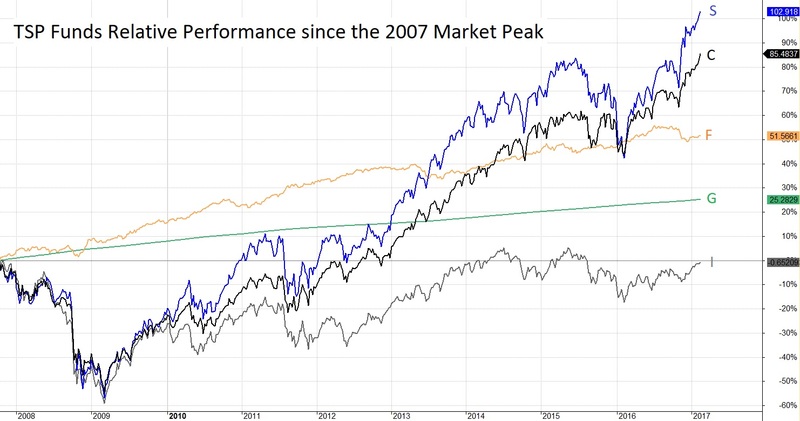 How did our Seasonally-Modified Buy & Hold strategy perform since the 2007 market peak? 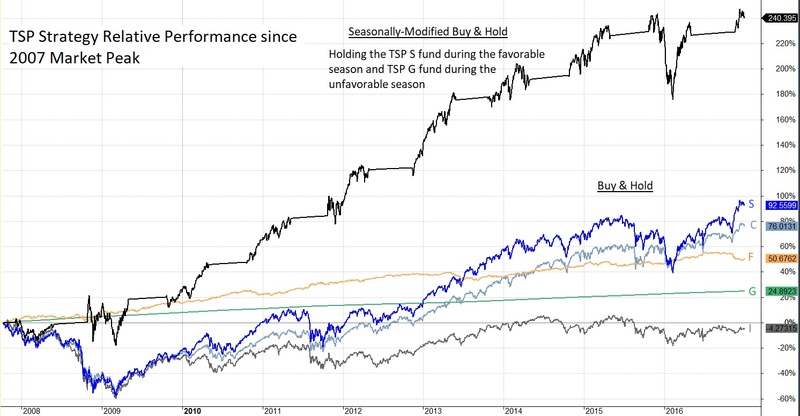 Again, the strategy employed in the chart above merely sits out the summer and fall in the TSP G fund while capturing most of the market's gains which occur during the winter and spring. You can explore our results page for more on both the TSP S and C fund's favorable/unfavorable season return specifics. The SP500 led the way in the 2000 market bubble with investors pouring money into the popular index funds. But notice the end game where the small and medium capitalization stocks represented by the S Fund went on a rocket ride at the end of 1999 catching up with the S&P 500 at the top. The small capitalization stocks lost more during the bear market and ended up no better off than a G Fund investor at the market bottom. The S Fund was down 55% from peak to trough requiring a 220% return to get back to its peak value which amazingly it did once again by 2006. If you think this supports the buy and hold argument, I would like to refer you back to our simple strategy that avoided most of the losses while capturing much of the gains. Ten thousand dollars invested in the S fund from 1991 to 2016 turned into a respectable $83,000, if you simple avoided the unfavorable half of the year as determined by our strategy you would have ended up with $240,000... it's your retirement fund, which would you prefer. The TSP G Fund looks like the tortoise racing the hare in this chart and I would not be surprised to see the TSP C fund and TSP S fund revisit the TSP G fund returns during the next bear market. If you want to learn more about how we keep-it-simple and send out e-mails for these two allocation changes annually please read about our service. Since we realize many investors do not want all the bells and whistles of following daily or weekly financially news, we provide a low-cost service that is designed to eliminate the noise from your life. BUT.... still alert you to conditions that have been met in the past with significant losses.